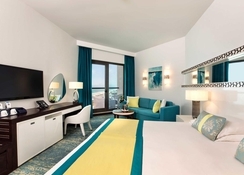 JA Ocean View Hotel boasts a prime location on The Walk, Jumeirah Beach Residence, Dubai’s only outdoor seaside shopping promenade with 1.7km of restaurants and shopping outlets. 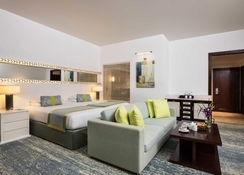 It is located very close to the beach and the hotel’s rooms offer amazing views of the Arabian Gulf from all sides. Spread across 25 floors, the 342 guest rooms guarantee you plush and spacious accommodation for a relaxing stay in Dubai. The rooms are well equipped with modern amenities and conveniences, along with a handful of interconnecting rooms available for larger groups or families. There are five restaurants and bars on site that offer a variety of choices in cuisines and drinks. 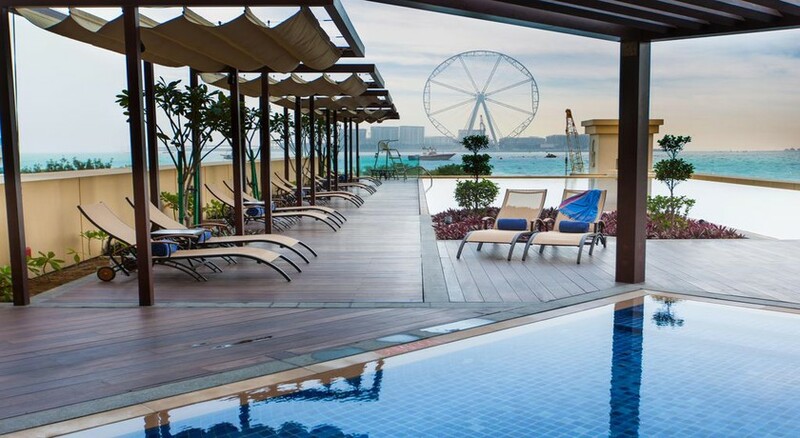 The outdoor temperature-controlled swimming pool comes with an elevated deck that provides sea views, while the children’s splash pool offers plenty of fun for the little ones that is complemented by activities at the kids’ club and the outdoor play area. Beachcombers can bask in the sun on the golden sandy beach, just 50m away. On weekdays, you can also enjoy a free shuttle ride to the private beach resort at the JA Jalebi Ali Golf Resort. Those looking for complete relaxation can visit the Calm Spa & Salon, which has a sauna, steam room and Jacuzzi. 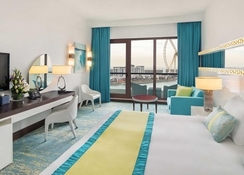 JA Ocean View Hotel is located along The Walk at the beachfront JBR. Set in a prime area of the city, this hotel is just 50m from a private beach. The Dubai Marina lies in walking distance, while the business areas of Dubai Media City, Dubai Internet City and Knowledge Village are just 5-10 minutes’ drive away. The Dubai International Airport is around 30-minute drive from the hotel. The 342 rooms and suites at the JA Ocean View Hotel are divided into five categories and all feature magnificent views of the Arabian Gulf. The room categories are: Sea View Rooms, Superior Sea View Rooms, Club Sea View Rooms, Sea View Junior Suites and Family One Bedroom Suites. There are 153 interconnecting rooms, suitable for families and larger groups. The hotel also provides some rooms for disabled guests. 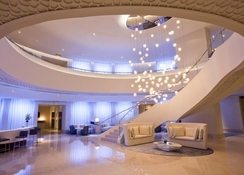 The Club Rooms and Suites serve you free snacks and provide access to the Coral Lounge situated on the 24th floor. With a balcony offering sea views, the rooms have air conditioning, soundproofing, safety deposit box, LCD TV, Wi-Fi and en-suite bathrooms with bath amenities. With a clutch of superb restaurants, cafés and bars, JA Ocean View Hotel Dubai offers a choice of dining options, enjoyed both indoors and al fresco. Le Rivage is a French-style brasserie with live cooking stations offering breakfast, lunch and dinner. Caffe Via serves coffee and light snacks. At The Deck, you can sip on some of the best cocktails in Dubai by the poolside. Girders is a British sports bar with a huge selection of drinks from around the world, while the Girders Garden is an outdoor garden themed terrace. 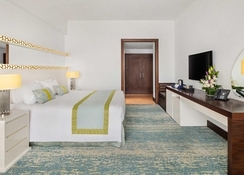 If you’re looking for leisure, take a dip at the outdoor temperature-controlled swimming pool of JA Ocean View Hotel, or hit the private beach club at its sister property, the JA Jebel Ali Golf Resort, which arranges daily shuttle service for guests. You can also lounge on the public beach at The Walk JBR. On weekdays, do not miss taking a free shuttle to the nearby golf course at JA Jebel Ali Golf Resort. The outdoorsy traveller can drive a fully modified 4X4 Jeep Wrangler through the dunes of UAE. JA Ocean View Hotel also offers you a state-of-art gym equipped with well-experienced trainers. The on-site Health Club features Jacuzzi, sauna and steam room, while The Calm Spa offers a selection of facials, massages and body treatments. The young guests can make a splash at the shaded kids’ pool or have a fun-filled day at the CoolZone kids’ club. the hotel provides complimentary shuttle services to main shopping malls and leading tourist spots in Dubai. Different policies and additional supplements are on offer for a group booking.